Q. WHY WERE JET CARDS LAUNCHED AND WHAT WERE THEIR MAIN PURPOSE? Jet cards are a relatively recent addition to private aviation offerings. Air Partner was one of the first to offer a private jet membership program when it introduced its JetCard over 14 years ago, pioneering the flexible jet card scheme. The card offers the perks of private flying, without the overhead costs and asset depreciation of owning, or fleet constraints or poor utilization associated with fractional schemes. It is suitable for a whole range of travelers, from frequent flyers to those flying a few times a year but in need of a stream-lined booking process and peace of mind guarantee. Q. HOW DO JETCARDS WORK? One of the key benefits of schemes like JetCard is that, in comparison to other alternatives, they significantly reduce the stress and simplify the process of traveling privately. Fractional schemes have complex pricing and contracting requirements, whilst on demand charter is volatile in terms of cost and can be extremely complicated to arrange. Our JetCard allows frequent flyers to pre-pay for their flying hours and subsequently benefit from a whole host of flexible benefits, such as a guaranteed aircraft with as little as 12 hours’ notice, inclusive hourly rates with no hidden charges, unlimited number of users, round trip discounts and hours that never expire. The card is prepaid with 15 hours or more flying time in a choice of six private jet categories. Our JetCard offers a premium service - along with flexible benefits, clients receive a tailor-made service, with all their preferences known in detail by a dedicated Account Manager. One further aspect of the program is that it allows members to budget a number of years in advance, due to its fixed price and zero annual escalator guarantees. Q. HOW DOES THE AIR PARTNER JETCARD PUT YOU FIRST? Simply offering a jet card isn’t enough – aviation providers must be proactive to retain clients. It goes without saying that outstanding client service and frequent enhancements to products is the key. Air Partner’s Customer First program places customers at the heart of every decision that the company makes, differentiating its offer from competitors and building on its brand identity. The member services team take the time to get to know clients, whether over the phone, in meetings or even over dinner, and go the extra mile to mark important milestones such as birthdays and anniversaries. Air Partner also offers personal airport representation for departure and arrival. A further way Air Partner seeks to promote loyalty is through its client referral recognition program, rewarding clients for any referrals that they make. In addition, the company has placed a particular focus on its on-board dining experience. Bringing the control of catering in-house is unprecedented within the charter broker industry. As a result, Air Partner is able to provide a consistently high offering across all its flights. It also provides a choice of local speciality menus from the top destinations. 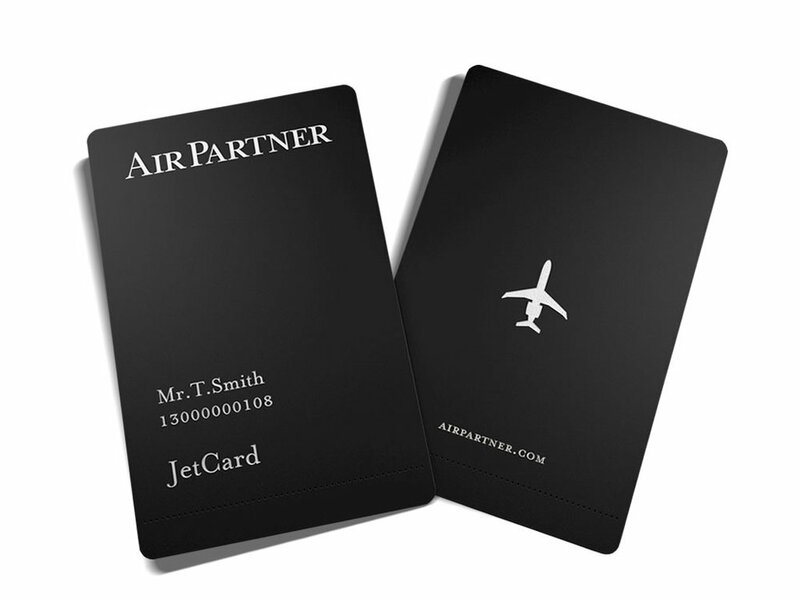 A combination of consistent enhancements and developments to the JetCard program and benefits that are flexible to clients’ ever evolving needs has helped Air Partner retain its place as the preferred supplier to some of the world’s leading corporations, business leaders, sports teams, creative talent and high-net-worth individuals. Further exciting enhancements for JetCard users are in the pipeline. Q. WHAT MAKES A GOOD JET CARD? A good card is one that is simple to use, flexible to the needs of the client and with costs clearly laid out. At Air Partner, JetCard members enjoy fixed and fully inclusive hourly rates so there are no hidden extras such as landing charges, de-icing fees (which alone can add several thousand pounds to the cost), or fuel and catering costs. It also offers fully refundable flight hours that never expire so customers can choose how much and when they wish to travel without being forced into a use by date. Furthermore, the membership can also be used for charter services – ranging from helicopters to global jets – as well as a variation of flights around the globe. Also offered are round trip discounts, an exceptional cancellation policy and fully global coverage. In fact, Conklin & de Decker, the independent aviation consultancy, ranked Air Partner JetCard the most flexible membership program in Europe in October 2017. Q. IS THE POPULARITY OF JET CARDS INCREASING? The market for jet cards continues to grow. We have seen a particular growth in JetCard utilization, up 41% in 2017. Q. WHAT DOES THE FUTURE HOLD FOR JETCARDS? A private jet experience is more accessible now than ever. Financially, it is well within the reach of those who regularly fly first or business class. We are seeing a change in buying habits at Air Partner, with ‘experiential luxury’ and ‘transformative travel’ in high demand, with people willing to pay for a superior experience. According to WealthX, the average jet owner is around 60 years old and male. In Air Partner’s experience, the new breed of charter customers is far younger than the typical jet owner, just as likely to be male or female, and is after a personalized service. The expectation for growth among some in the industry is that 50% of their future customers will not have been active charterers before.